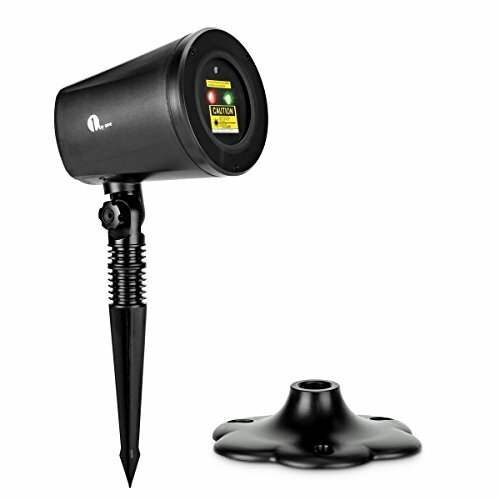 If you wish to have a festive Christmas then one of the best ways to do that is by decorating your lawn with a quality light projector. The market is oversaturated with lots of options and finding the right product for you can be difficult. I’ve assembled here a list of what I’d consider the best laser lights for Christmas holidays. In making this selection I decided to analyze certain key factors that basically everyone no matter their budget considers as essential and so in no particular order they are: efficiency, reliability, and value for money. 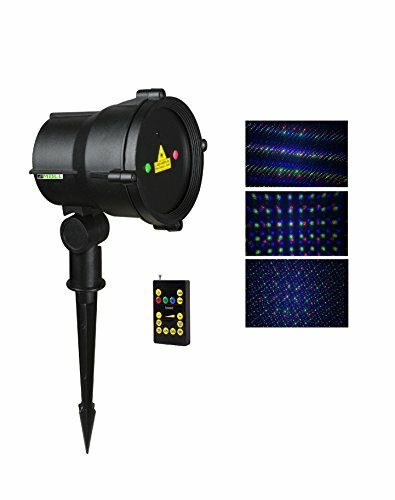 A good Christmas laser light projector should be capable of providing what is expected of it in a reliable manner and overall feel like it was a worthy purchase. I’ve included plenty of more affordable options for those simply looking for a little decoration and also there are enough advanced ones which are more expensive. The latter is dedicated to the people trying to get the most high-quality illuminating experience. Coming from one of the most trusted brands in the industry 1byone, this is their powerful laser light system specifically created to enrich the Christmas atmosphere. It projects a huge area illuminating it with thousands of pretty stars and Christmas trees that are sure to bring joy to everyone around. If you are tired of putting up wired lights and messing around with ladders than it’s probably time to consider a projector such as this one. 1byone made this model very easy to use, it employs just a single button for switching between light modes, patterns, and colors. Aiming is also done with no issues thanks to the included adjustable mounting stake. It’s always this kind of simplicity that makes for a convenient product. The materials used are of decent quality, adequate considering the price. This laser light is also waterproof so no matter the weather your house will sparkle with magical holiday illumination. 1byone implemented 2 colors, 2 patterns, and 10 lighting effects so there’s plenty of variation. Other features of this projector are a light sensor for operating only at night, an integrated timer to ensure the light is off after 6-straight hours of illuminating in the darkness and a useful rotating function. This allows the Christmas laser light to be more easily pointed in any direction. Considering the beautiful outdoor and indoor illumination of these energy-efficient lasers incorporated in this model that truly transform any house into a dazzling Christmas-themed wonderland, I totally recommend the 1byone Magical Christmas Laser Light. For more professional results when it comes to Christmas laser illumination, I think you will find this model more to your liking. At a considerably higher price than some other projectors, the SROCKER XLRGB has plenty to offer and is probably the most high-quality and reliable product currently on the market. Setting it up is a breeze as it can be fully installed in just a few minutes. It takes a bit of time to warm-up but it does not disappoint on its decorating abilities. It has brighter and sturdier professional lasers (Class 2) than the more conventional laser modules. The projector can be remotely operated using the included RF controller from an effective distance of up to 12 meters (without taking into account dead angles). The laser lights used in this unit are FDA approved and they’re safe for daily use, just make sure you don’t stare into the light directly for a long time. The housing of this laser light model is heavy cast aluminum, very solid and robust and with an IP65 seal rating for reliable protection against dust and to prevent contact with moving parts inside the enclosure. The effects of the SROCKER outside are quite impressive, the laser light has a massive coverage and is significantly brighter than cheaper models. If making the best decorations for Christmas or other festive events is what you desire, then you can’t go wrong by investing in this extremely performant projector. 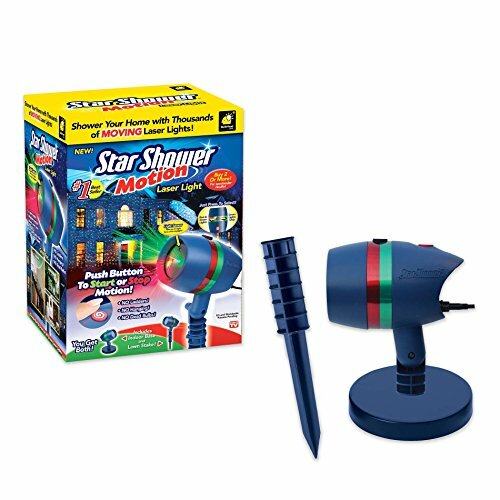 In this day and age, hanging Christmas lights has become a thing of the past thanks to products such as the BulbHead Star Shower. It projects moving laser lights for that special festive feel and it works outside as well as inside your home. It combines a waterproof, robust design with great accessibility as virtually anyone can set it up in a few quick steps. The Star Shower Motion Laser Light has been quite popular on the market of Christmas projectors and there are some reasons for that. With just a click of a button, it can add more color and shimmering patterns of light on or inside your house. It operates on two color modes, the user gets to choose between green lights only or a dazzling combination of red and green ones. The list of features is completed by a built-in light sensor, weather resistance, and energy efficiency. This hassle-free device can offer you more time for other things as it makes decorating with light such a straightforward process and it can also save some money when compared to the bigger electrical consumption of traditional lights. If you are worried about reliability issues, then here’s another interesting aspect of this laser light. The Good Housekeeping Institute has certified the Star Shower with their quality-tested seal as it has been assessed to perform just as intended. All in all, this projector is a decent buy despite maybe lacking some options from the more expensive models. It’s a great deal especially for those on a budget. 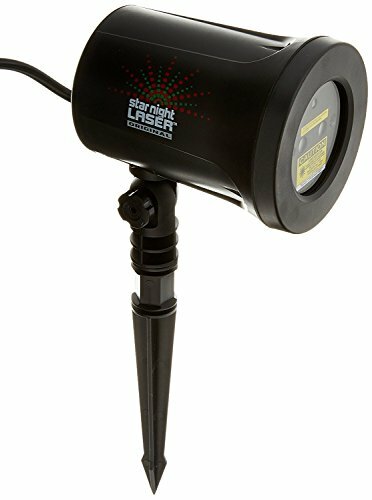 The Starry Laser Lights Landscape Projector is ideal for Christmas and holiday entertainment or any other festive parties. Coming from one of the best brands in the industry of laser lights, Starry, this product has all the features to satisfy your decorating needs and its price tag is rather modest considering what it offers. The area covered by this model is large enough as it can reach up to 1200 square feet if distanced at around 25 feet. It comes in red and blue laser emitted colors brightening up any house with thousands of blinking stars. Depending on the light intensity, Laser Christmas lights have the convenient ability to automatically turn on or off and as a consequence to potentially reduce your energy bill as opposed to traditional lights that consume much more. Thanks to the included indoor base you can set it up easily inside your house or if you’d rather install it outside, there is also an outdoor plug to help with that. 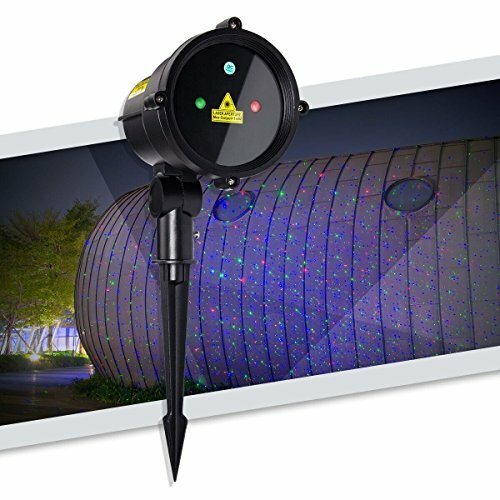 Starry Laser Lights Landscape Projector has been certified by FDA, FCC, ROSH and is also waterproof (IP65 test). With such a broad application, this performant and reliable projector might be exactly what you are looking for, so don’t pass up the chance to considerable improve your holiday experience with this magnificent landscape projector. A fully featured Christmas laser light projector shouldn’t necessarily be above most people’s budgets and a convincing example of this is the LedMAll Remote Controllable Laser light. It’s a very well designed and highly performant projector coming from one of the leaders in laser lighting applications. Without further ado let’s jump straight into the capabilities of this projector. This review is for the static version. It has a decent coverage and some satisfying brightness and it can illuminate using the full RGB specter of colors. They can be mixed or projected in single mode and are operated with a remote controller in either Flash or Static mode. It fits best outdoors but it can be used indoors as well depending on personal preference. The laser can take some time to heat up, especially in colder conditions but this is normal, you have to wait a few minutes to get to its full power. Because timing is important, LedMALL included settings for 2, 4, 6 and 8 hours durations with a flashing mode function. 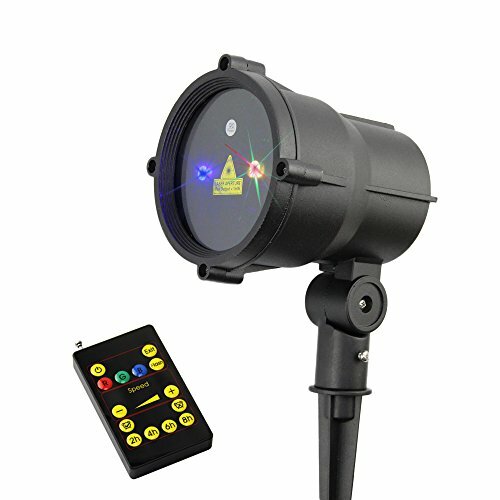 The Laser light comes enclosed in a sturdy metal case and has the IP65 certification for waterproofness. If you are the kind of person bothered by complicated installations then you will be relieved to hear that this device works on the ‘plug and play’ principle. Just stake and plug it in – the power cord has good range flexibility. Thanks to cutting-edge laser and holographic technology included in this projector, your days of climbing on ladders and attaching strings of wasteful lights are over. Another great product from 1byone is this cost effective Christmas Light Projector made with aluminum alloy. It provides some amazing laser shows to get your family and friends in the festive mood during the holidays. If you’ve had enough of the hassling of decorating using the traditional string lights and want to take a more modern approach to your light show then this product will get the job done. Instead of wasting hours hanging old-fashioned lights, all you have to do when it comes to this device is basically plug it in, turn it on and watch the spectacle as your garden or house becomes engulfed instantly in dazzling green and red lights. This festive atmosphere created can by extended on quite a large area as the laser lights of this 1byone projector cover up to 2,100 square feet from a distance of 25 feet. A fantasy world can also be created indoors like in a kids room for example. 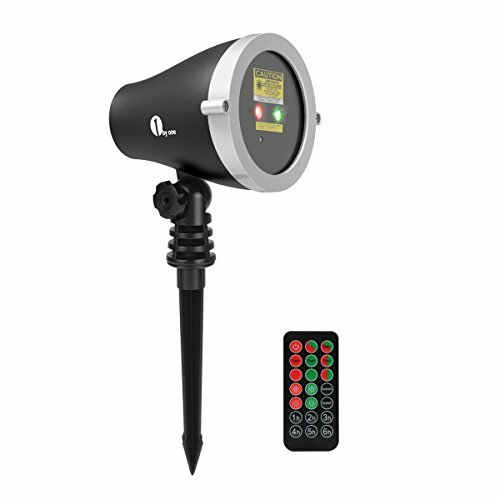 Besides the wide illumination range, this Laser Light is made of Aluminum Alloy to withstand some more difficult weather conditions like snowing, raining and even intense sunlight. A wireless remote controller is included in the package to simply stand back and control with ease the laser light modes and all the other settings. A long power cable (11.15 ft) offers some flexible range. In conclusion, this is one of the best projectors out there for illuminating mostly because it offers valuable features at a very accessible price so it’s definitely worth considering. IP Protection: IP65 for the light casing and IP44 for the power adapter. 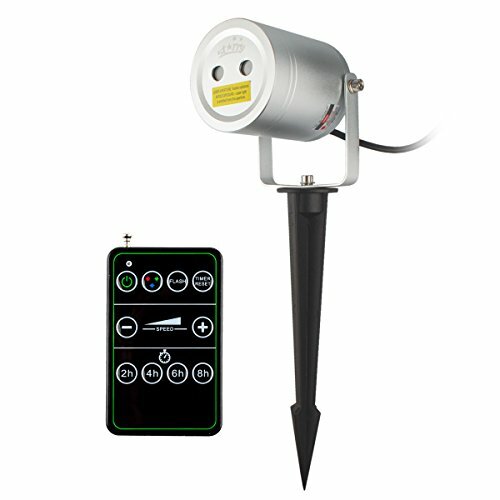 Poeland Garden Laser Lights boasts with an impressive Class 2 high standard laser light source along with a solid aluminum alloy body and it’s definitely one of the best models in this selection. Take into consideration that a high-quality projector like this one is priced accordingly, but don’t let this discourage you. If you are in the market for an expensive laser light consider this option from Poeland. Besides the powerful and bright Class 2 laser, there are other features that make this model a worthy buy. It has a smart RF controller for selecting the different options like colors, speed, and modes. A very customizable 24 hours timer helps the user to set the operating time in different increments like 2/4/6/8 hours and grants the ability to turn off the projector for the next 22/20/18/16 hours so as to operate again next day in the darkness. This device can run safely even in very cold or hot weather, the operating range of environment temperature is between -30 up to 40°C. The aluminum alloy body is designed with strength in mind and gives a better quality feel than a cheap plastic case. It’s listed as waterproof along with the adapter and is very capable of creating some fantastical shimmering patterns of light outdoors or indoors. To sum up, this high-performance laser light device should enhance any holidays experiences thanks to its high-quality construction and components and practical, simple to use features. One great aspect of this projector is the easy installation. Simply plug and play, no other tools are needed, and no time-consuming effort to hang string lights. The laser has small and big spreading points and it can change brightness automatically. The RGB Moving Firefly Garden Laser is called that way precisely because it will add a magical sparkling effect in your garden, similarly to thousands of moving firefly. It can cover a much larger area than any traditional lights and it offers 7 lighting modes allowing for the display of multiple RGB combinations. Controlling is done from a distance using a wireless remote with clear yellow buttons. The effective distance for the infrared remote is approximately 7 meters. With it, you can also set up the timer just through pressing the 2h/4h/6h/8h hours On. With laser holographic technology, it offers some breathtaking projections suited for Christmas or any other special events. The projector’s build gives a premium quality feel and is resistant to all weather conditions. If you are looking for the most efficient Christmas lights solution, try out this projector, you won’t be disappointed. 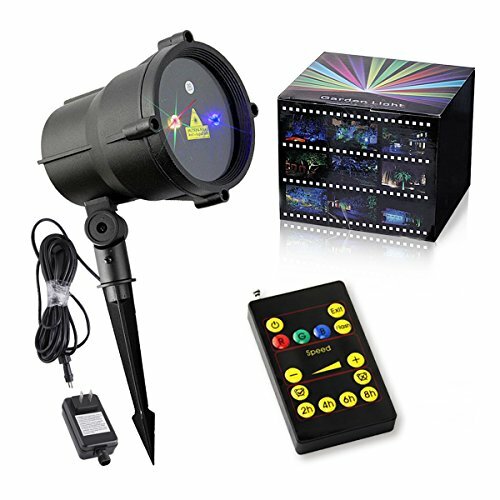 Starry Laser Lights offers in this model a powerful projector that should cover all your lighting needs and will finally help you get rid of all those conventional string lights which are just not worth the effort. It pretty much offers what any other projectors do for this money but it looks better thanks to the sleek aluminum case. These laser lights have quite an outstanding covering capacity 3900 square feet from a distance of approximately 25 feet. They should be able to successfully decorate any landscape and are especially recommended for Christmas as they have a Red & Green version. To control the patterns, the moving speed or the timer, the RF wireless remote comes into play. With its help, the colors can be mixed or projected in single mode. The ease of use for this projector is one powerful feature, you can have thousands of stars blinking on the wall, the ceiling, or on your lawn in no time. Thanks to light sensibility sensors, the Laser Christmas lights can turn on or off automatically and save energy. It is obviously a much efficient option than general string lights. For your convenience, the projector and the power adapter are waterproof so you shouldn’t have to worry about outdoor conditions. Wherever you choose to use it, Starry delivers a promising product which will definitely help you achieve that fantastical Christmas atmosphere to be enjoyed by everyone including your family, friends, and neighbors. Perhaps the best choice for an entry-level projector, the Star Night Shower Christmas Lights from Tristar offers decent quality for a fun experience during the holidays. For a very affordable price, you can decorate your home instantly in a spectacular way. The device can illuminate with 7 different design patterns combining bright red shades with vibrant green ones. With a single Star Night Laser, you are able to cover up to 3,000 square feet. It has a built-in timer and should resist most tough weather conditions. The setting up goes down smoothly thanks to a mounting stake system that facilitates the job. It is easily ready to be placed anywhere outside or inside your home, capable of year-round decorating but is especially great for Christmas. The unit is compact enough with a reasonable length of cord and it doesn’t have a big clunky power supply at the end like other brands. Despite not expecting much, the laser show that this projector puts is certainly more than satisfying as there is a lot of variety of the dancing lights and the quality of the light is on par with other slightly more advanced models. It may not be as reliable as its more expensive counterparts but it’s still a great deal that you shouldn’t pass up if you are in the market for a laser projector that’s cheap and solid all-around.